Food donation plays a critical role in addressing food insecurity across the country. However, many cities have not had a way to quantify opportunities to expand food donations from the wide array of businesses and institutions in their area. In response, NRDC has developed a methodology for assessing the supply of surplus food that could hypothetically be available for donation from food retailers, restaurants, and institutions such healthcare and hospitality facilities, colleges and universities, and K–12 schools. NRDC applied this methodology to three cities—Denver, Nashville, and New York City. The results are represented in the geographically based visualization tool. To learn more about the research methodology and findings, please read the full report, Modeling the Potential to Increase Food Rescue: Denver, New York City, and Nashville. This map visualizes the quantities of food estimated in our research on Denver, Nashville, and New York City. The geographic areas assessed are outlined with gray lines. This particular representation shows the maximum potential scenario, including the most optimistic assumptions about potential amounts of food that could be donated within each sector. The map is best viewed in Chrome browser. The green circles on the map represent groups of potential donors by location. 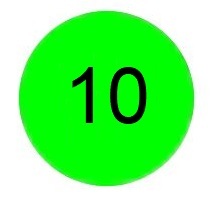 The size of the green circles, along with their corresponding numbers, indicate the quantity of potential donor locations identified in our research. This feature helps identify high concentrations of potential donors. The circle’s color intensity reflects the range for the variable selected in the dropdown menu on the top right. The three variables include “recoverable tons per year,” “location employee size (actual),” and “recoverable tons per day.” A higher color intensity (bright green) represents a higher range for the variable selected, while a lower color intensity (white) corresponds with a lower range. When zoomed in, the circles on the map will adapt to reveal more detail. To maintain the anonymity of the locations, the smallest number presented is five locations together in one circle. As the user changes the map area boundaries, locations are regularly regrouped to maintain anonymity (so circles may appear to move on the map when zooming in and out or scrolling laterally). Additionally, when changing the map area, the filterable metric maximums and minimums (for instance, for recoverable pounds per day) will adjust to show the quantities present in the current screen view. If fewer than five locations fulfill the designated metric, no circle will be shown. There are four options to filter which locations are displayed on the map: “category,” "number of employees at the location,” and “recoverable amount per day” and “recoverable amount per year.” Within the “category” filter, an additional layer of filtering can be applied to display specific sectors (for example, “university” or “grocery.”) To remove the sector filter, click on the “x” at the right side of the frame. The default option shows all sectors that were included in the analysis. The sliders below the category section can also be adjusted to filter for the elements shown, such as quantity of potential rescue. To remove a filter, click on the “x” to the right of the slider.